"It is generally understood that a party hardly ever goes the way it is planned or intended. This last, of course, excludes those dismal slave parties, whipped and controlled and dominated, given by ogreish professional hostesses. These are not parties at all but acts and demonstrations, about as spontaneous as peristalsis and as interesting as its end product." 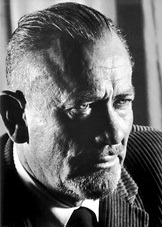 I am finding myself wishing that Steinbeck had gotten around to writing a movie or two, so as to have blown all our minds out of their stagnant, film-crusted waters. Ah, well. Grateful enough am I for the books I've read thus far, and the ones still left to tickle the interstices and intertrodes of my brainic areas. I'm have a crush on a dead white guy, who perished before I was born.